Remove the fat from the underside of the duck breast with a very sharp knife and cut in small cubes. Place the cubes in a bowl and add the rest of the ingredients, keeping aside half the marinated ginger. Season with salt and pepper to taste and mix again. 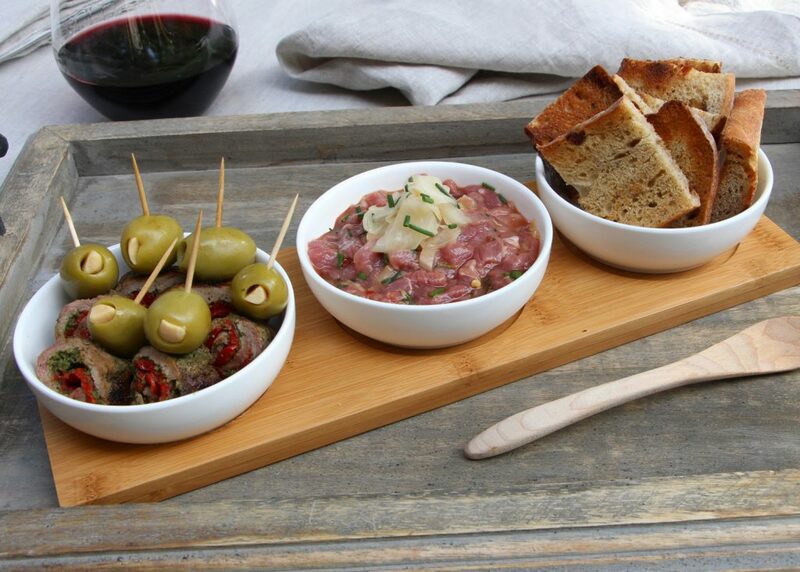 Arrange the tartare in a small serving bowl and garnish with the rest of the marinated ginger. Serve immediately with a small spoon and pieces of toast. Remove the fat from the underside of the duck breast with a very sharp knife and cut in three thin slices. Flatten the slices gently using a meat mallet, first covering them with a sheet of parchment paper. Season the slices with salt and pepper and brush them with a layer of pesto. Cover each slice partially with the red pepper slices and roll along the wide side, then tie the roll closed with kitchen twine. Sprinkle the rolls with smoked paprika and grill over medium-high heat for about ten minutes in a pan with some duck fat. Turn several times during cooking. Remove from the heat and cut in bite-sized pieces. Carefully remove the kitchen twine and spear each piece with a toothpick and stuffed olive. Serve immediately and sprinkle each plate with a pinch of smoked paprika.